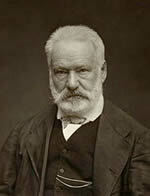 Les Misérables by Victor Hugo is widely regarded one of the best novels of the 19th century. Les Misérables by Victor Hugo traces the experiences of an ex-convict, Jean Valjean during a tempestuous period in France ending with the June Revolution. The story, centered around Paris, deals with politics and moral philosophy. Les Misérables has been adapted to numerous productions for the theatre, and motion pictures. Recently a musical adaptation went from the stage to the movies, and won Oscar acclaim. This work can be found for FREE at Project Gutenberg.